Iran’s eight presidential candidates clashed on issues of culture, personal freedoms and women’s rights at the June 5 debate. 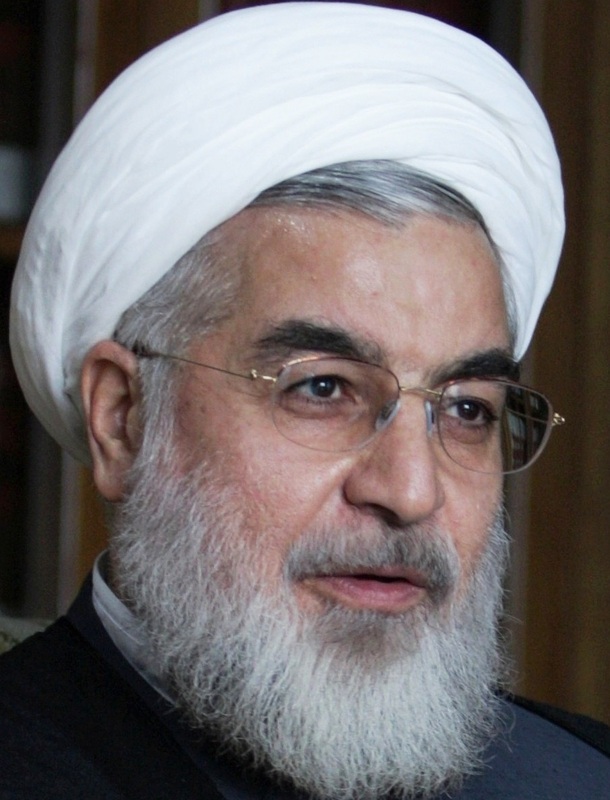 Hassan Rouhani and Mohammed Reza Aref repeatedly criticized government censorship of the internet, press and academia. They argued that censorship had prevented Iranian artists from creating quality productions and led people to watch foreign television shows and movies. Rouhani and Aref opposed the confiscation of satellites dishes and interference in people’s private lives. 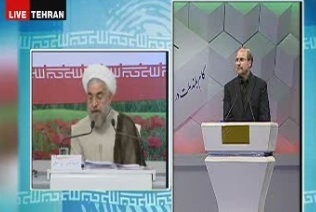 Even two conservative candidates ―Mohammad-Baqer Qalibaf (below in black) and Ali Akbar Velayati― challenged government filtering. 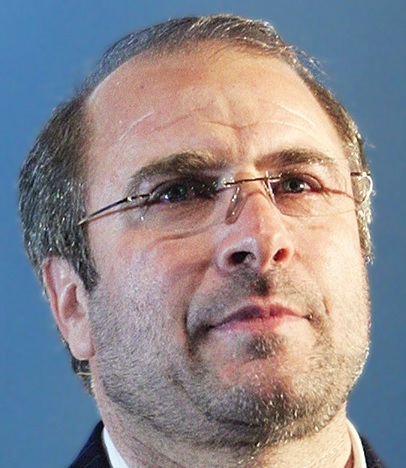 But Gholam Ali Haddad-Adel and Saeed Jalili defended state social controls. 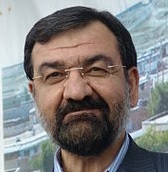 Jalili claimed that movies like “Argo” and “Lincoln” have furthered U.S. policy goals. He called for the production of movies to promote the Islamic revolution. Candidates also took opposing positions on the rights and role of women. Rouhani (left) promised to establish a ministry of women’s affairs if elected. “We must give women equal rights and equal pay,” he said. But Jalili argued that women should fulfill their family role at home. His campaign seemed to temper his statement with a tweet pointing out that his wife, a doctor, is a working woman. The following is a rundown of remarks and points made by each candidate during the debate. • Give freedom to the press to eliminate corruption. In the event of violations, governments can close newspapers. • The state should not interfere in private life. Police should not interfere with how people, especially youth, choose to dress. • The state should not fire university professors for political reasons or impose harsh restrictions on students. • Open up space rather than condemn anyone who thinks differently. • Art can be a great tool for cultural diplomacy. • Establish a ministry of women’s affairs and give women equal rights and pay. • Women who head households should get financial support. • Artistic activities are not a privilege that a government can revoke. • Culture is not just a right, it is an opportunity. But the state must ensure that it is kept pure. • Iran should promote the Islamic revolution through cultural productions. • A president must know the cultural arena’s capacities well, and he should use them as tools. • “Argo” and “Lincoln” served the U.S. government agenda. • Management of art and culture should be taken away from the state. Artists should be put in charge of culture. • State television should not be afraid to hold real debates. • Political decentralization will not improve public culture. • Culture cannot thrive under strict controls. • Do not criticize cultural policies just to garner votes. • The government should set the agenda for cultural activities and create a “culture of resistance” based on Iranian and Islamic values. • Foreign soap operas broadcast on satellite channels are harmful to Iranian families. • If Iran is not independent in the field of culture, it will not be independent in politics, economy or other sectors. • Iran’s Islamic culture has influenced the region. • Women have a right to education. Homemakers are not “jobless.” They need to be insured. • Who has influenced who? Has Iran influenced the West, or has it influenced Iran?